2013-14 O-Pee-Chee Hockey Glossy Inserts Checklist and Guide. As soon as 2013-14 O-Pee-Chee Hockey was released, collectors began to wonder what unannounced insert was in-store for the product. Due to the wildly popular Black & White inserts from 2012-13 O-Pee-Chee Hockey, it was a virtual lock for something similar to be included this year. 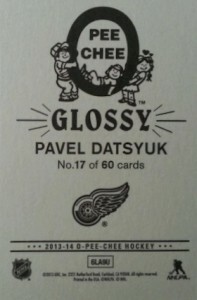 Collectors soon discovered the 2013-14 O-Pee-Chee Hockey Glossy Inserts and it was off to the races. 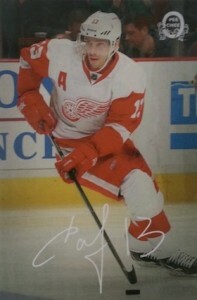 The very simple design features a full-size player image and facsimile autograph. The only other design element, other than the obvious glossy finish, is a small OPC logo in the top corner. Except for an oversized OPC logo, the card back is equally plain. The rare set is a throwback to the Glossy Inserts found in 1977-78 O-Pee-Chee Hockey and Topps Hockey. The set had both round edge and square edge versions. Topps also featured a Glossy insert in 1976-77 Topps Hockey. The full 2013-14 O-Pee-Chee Hockey Glossy Inserts checklist features 60 cards and includes top current players and former greats, as well as two cards for the Quebec Nordiques. The now-defunct Nordiques became the Colorado Avalanche. While only a few have sold on eBay, the majority have brought in $50 or more. Look for prices to remain strong as collectors realize how rare these cards are and bigger players surface. One thing to note, the Black & White checklist from last year only contained 36 cards. With 60 cards this year in the 2013-14 O-Pee-Chee Hockey Glossy Inserts set, collectors will likely have a bit more trouble when trying to complete the set. There are currently no official odds, but the 2012-13 O-Pee-Chee Black and White Black & White cards fall at 1:960 hobby packs and 1:1,920 retail packs. The full 2013-14 O-Pee-Chee Hockey Glossy Inserts set checklist can be found below and includes the listed team.